The organisers of Splendour in the Grass would like to advise that all tickets for the 2016 event, taking place Friday 22 to Sunday 24 July at North Byron Parklands, have now sold out. When tickets were released at 9am AEST today via Moshtix, every man and his music loving dog (except for Pistol and Boo of course) were waiting online to purchase, at least three times the number of the previous year. Splendour's Co-producers Jessica Ducrou and Paul Piticco said "Once again we have been totally floored by the incredible enthusiasm and support from the Splendour community. We can't wait to bring you another awesome edition of Splendour!" If you missed out this morning don’t panic! You still have a chance to get your hands on a ticket via the Resale facility. If you purchased tickets and can no longer attend the show, the ticket Resale facility gives you the opportunity to offload your ticket to someone who missed out. Recycle! The Resale will kick into action via moshtix from 9am AEST Monday 30 May and is now the only place where you can purchase legitimate tickets for Splendour In The Grass 2016. You can find out more info about the Resale and join a waiting list here. Also! Stay tuned for the news on Splendour 2016 Official Sideshows. They'll be announced Friday morning, 22nd April. DO NOT PURCHASE TICKETS FROM ONLINE AUCTION & SELLING SITES OR SOCIAL MEDIA. Splendour tickets include the name and date of birth of the purchaser. This is checked against your ID at the festival gates. There is NO facility in place that allows a ticket holder to change the name and date of birth on a ticket and transfer it to another person. And remember! Vehicle Passes for Day Parking and Camping will also go on sale at 9am AEST Monday 30 May through Moshtix or phone 1300 GET TIX (438 849). You need a car pass to bring a vehicle onsite and it pays to carpool! Organisers have made improvements to the Splendour site since the last event that will make for a more comfortable experience for everyone, no matter the weather. They’ve improved the access to and around the Amphitheatre and other venues, with better quality and additional pathways, and we’ve dug deep on the drainage. They’ve also changed up the camping! In 2016 there will be new camping choices available including the option to camp with your vehicle. The camping area closest to the event site will still be sans cars but we’re all about options. For the time being you only need to purchase your event and camping ticket. You’ll be able to choose where you park your rig when vehicle passes are released on Monday 30th May. Onsite camping is available for up to five nights - with early entry into the campgrounds available from Wednesday 20th July - so bunk in for an easy and affordable way to experience Splendour. Feel like treating yourself? Travel light and book yourself into Tepee Love, Flash Camp, Tent City or Byron Bay Camping Hire. Kids in tow? The Meadow, our family friendly campground will also return in 2016. Remember you will need to purchase a vehicle pass for the day you want to arrive, available Monday 30th May. 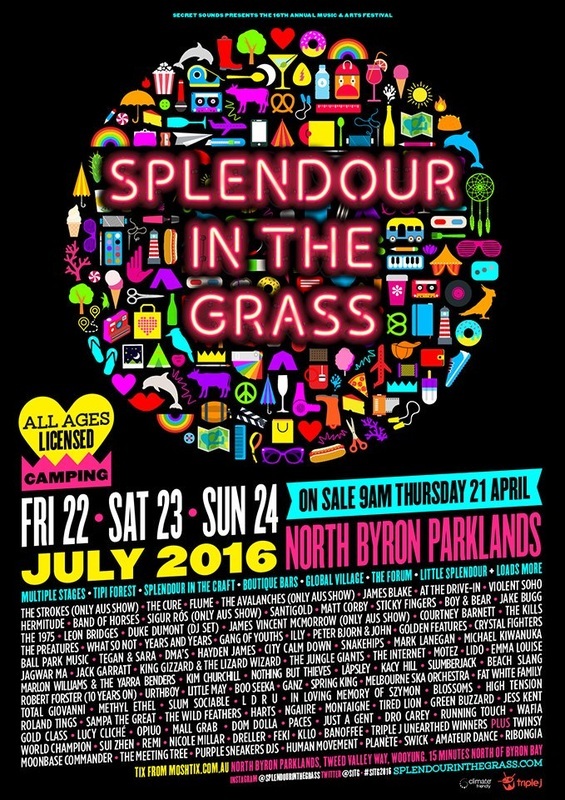 You can find more information about camping and vehicle passes at Splendour in the Grass. Keep your eyes on Splendour in the Grass and their Facebook page for more details.